With the rapid development of science and technology and the constant improvement of man's life, more and more people are drawn to mountainous areas and wilderness as well as other deserted areas, still unknown and unexplored by mankind. As a Chinese saying goes, "If you happen to come to the summit of a mountain, all the other mountains in you full view appear so insignificant." 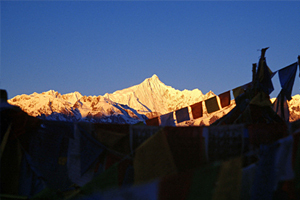 Mountains, with their unique charm, hold the attention of numerous mountaineering fans who are eager to acquaint themselves with hardships by strenuous climbing and look forward to having a word with nature at the summit. 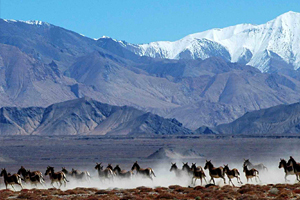 China, regarded as a kingdom of mountains, boasts countless alpine peaks of various sizes, such as Qomolangma (the highest peak in the world), Qogir (the second highest), Gongga (King of Mountains) and Namjagbarwa (the Huge Stone from Heaven). 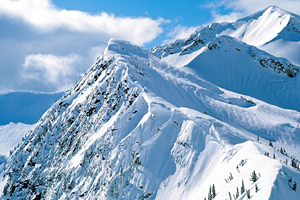 The beautiful and mysterious alpine peaks are worshipped as the sacred land by alpinists all over the world. A man of letters in ancient China once remarked that "Regardless of the height difference between mountains, they become famous only if there are celestial beings". In China, every peak is endowed with a beautiful and moving myth while each signifies human fortitude and their constant strive to improve themselves from generation to generation. People in the mountain areas love and worship mountains, thinking of them as "a holy and pure land" where God lives and is embodied. Furthermore, the plain worship has always been the spiritual power with which they live on for many generations. Not only are mountains majestic, solemn and respectable but also full of goodwill and feelings. On one occasion, they may be tender and dear to you, but on another, violent and capricious, depriving people of the chance to approach them Though having cruelly taken the lives of Maluoli, Shantiansheng, Ding Xingyou and the seventeen warriors in Moirigkawagorbo, they have given honor to a great number of alpinist heroes and heroines such as MeisiLa'e, TianbuJiangcun (transliteration) and Pando. Therefore, it is nothing strange at all for people to ask, "What in fact are mountains?" Now, let's trace the history of mountain climbing. In 403 A.D., Monk Fa Xian and his two companions set out from Najieguo (transliteration) to make an ascent of the Lesser Xue Shan in the south. Another monk, Monk Jing Hui, was the first to give his life to mountain climbing. 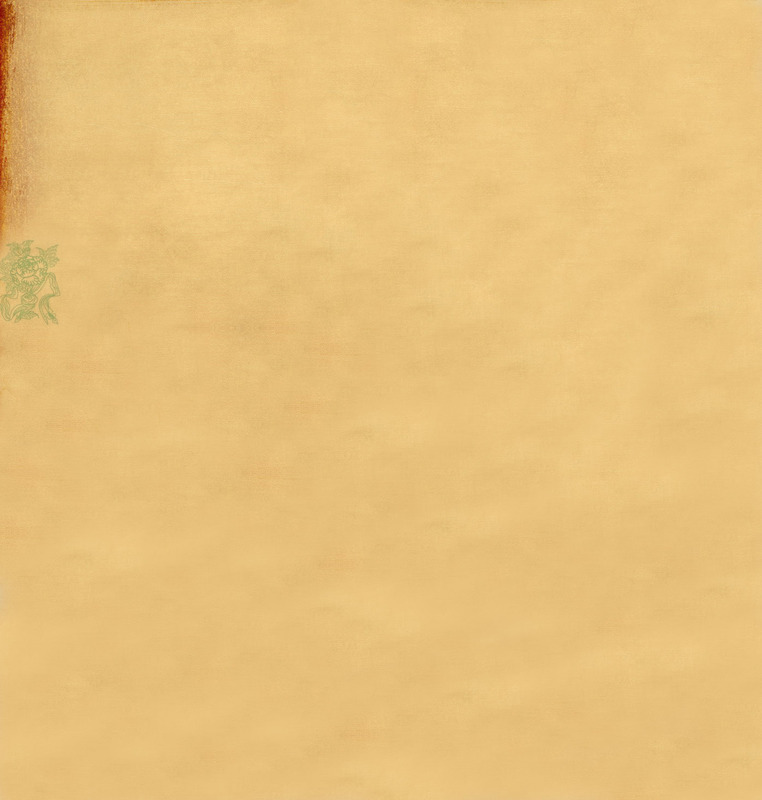 Then, in the 7th century, Xuan Zhuang, a reverend monk in the Tang Dynasty, braved many hardships, climbed over lots of high mountains and in the end reached Ling Shan with its green ridges and deserted nook in between. In 1786, for the first time in human history, M.G. Pakaer and J. Paerma (transliteration), a Swiss farmer, surmounted Mt. Brown, the main peak of the Alps, for the purpose of scientific exploration. Thereafter, mountain climbing was classified as a formal sport game. Nevertheless, wonders never stopped from coming. 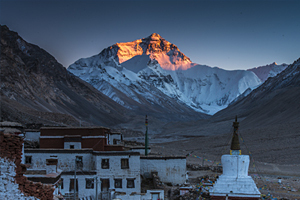 In 1953, E.Bullali and Danzen (transliteration) of the English mountaineering team conquered Qomolangma from the south slope. In 1960, Chinese alpinists, Wang Fuzhou, Gongbu and Qu Yinhua got to the summit of the world (Qomolangma) from the north slope. 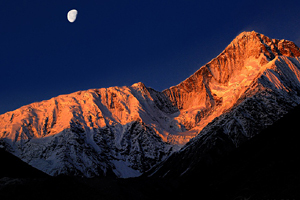 More exciting wonder appeared in 1988, when alpinists from three countries - China, Japan and Nepal - achieved the magnificent feat of ascending Qomolangma from both the south and the north slopes. Mountain climbing means much more than a mere sport game. It involves working hard and fighting against nature. As a sport of the brave, it enables people to keep fit, intelligent, courageous, hardworking and to cultivate a collective spirit as well. Moreover, man's view can be broadened and people's knowledge and life can be enriched. The conquest of a high peak challenges nature and alpinists themselves. It tests man's physical extreme and provide people more spiritual wealth than anything else. A case in point is in 1960, when the successful ascent made by Chinese alpinists of the world's highest peak encouraged the Chinese people to be more confident to overcome natural disasters. 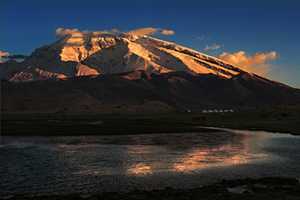 Man's sincere love for nature is best revealed in the adventure of mountain climbing. In spite of the great loss, an everlasting monument has been set up in history for those who have given their lives to it. Now, people are trying to be away from the busy cities for the deserted mountains, away from the crowds of people and the lure of money. They have found out that it is the eternal nature that they want to embrace and the world of mountains that they desire to be with. Mountains are nature's pets and the favorite sons of their mother - the earth. Man has always been in deep love with them. Besides, alpine glaciers have given birth to rivers on Earth while the precious deposit in the mountains are the material wealth on which human beings live. Not only being vast and magnanimous, but also high, steep and imposing, mountains inspire mankind to spare no effort to improve both nature and themselves. Do you love mountains, my friends? If so, welcome to China, in which "mountains dwell."